Why hello there... allow me to introduce you to the delightful Miranda. If you came to the recent Wellington Wedding Show you would have spotted Miranda and her team: trademark shiny hair, great skin, beautiful make up and all super cute in their pink pinafores, busily working on a bevy of gals in front of golden mirrors– encapsulating an aura of elegance, impeccable style and great taste. Exactly the kind of person you want looking after you, when looking good counts the most: on your wedding day! I’ve known Miranda for a while now, and I was aware that she was highly experienced and very good at what she does. But it’s only when you actually sit and probe a little further that you find out the depth of someone’s history. And so it came to pass that I discovered Miranda worked for my favourite museum in the world, behind the scenes in the Hair and Colouring Department of Madame Tussauds in London. And as chance would have it, Miranda was Kate Moss’ hand model when the model herself could not come in to have her hands moulded. “Storm, Kate’s agency said I was a pretty darn close match!” Miranda laughs. laid back way to share ideas and meet informally before the madness sets in. 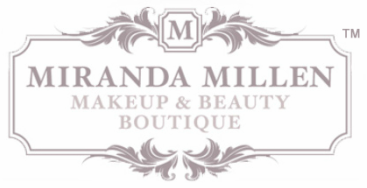 Often brides have booked Miranda before they have even chosen a wedding dress or theme for their big day! You can tell Miranda loves what she does and that she’s passionate about it. “I like making people feel good about themselves. You get such a sense of accomplishment when you have somebody who comes to see you who never wears any make up, and they say “I want to still look like me, and not look like I’ve got tons of make-up caked on.” And then when you are done, their face lights up with this amazing sense of surprise, like “Wow, I really am beautiful!” Miranda empathises with the many young ladies who don’t have a huge amount of confidence and loves nothing more than to bring their natural beauty out and give them a much deserved confidence boost. Now on to the hot topic at the tip of everyone’s tongue... airbrushing! Personally I’m just dying to know what it is!! Miranda explains to me that make-up, which was traditionally applied via sponge, fingertip or brush, was just too visible in the pores after the arrival of High-Definition for film and television. So experts set out to discover a way to apply make-up that was less visible, with an effect almost like not wearing any at all. And so airbrushing was discovered. A simple process via compressor that produces air attached to an airbrush which applies (i.e. sprays) the make-up lightly on to your face. Simple yet very effective! And of course amusingly to the more hands-on blokes out there, this technique rather seems familiar in the work shed too. Miranda explains “Basically it creates a more even coverage. I use Temptu which is the most amazing brand. It has a gorgeous silica ingredient which leaves the skin looking so luminous. Brides always tell me that it feels like they’ve got nothing on their skin. It lasts so well and photographs beautifully. And I get a lot of comments from photographers who tell me it minimises their work – they get better photos and need to do far less re-touching later.” I’m gob smacked when Miranda tells me that 100% of all her brides at present use airbrushing on their wedding day. Clearly she is on to a huge, massive winner here. Where was this stuff when I got married?! It’s so effective that one keen and eager bride even slept in her airbrush make up post wedding, and wore it to the day-after party the following day to great success. No one knew, and she was chuffed to get such a long lasting effect from her make up! And that to me ladies and gentlemen sums it up perfectly... with Miranda, you are on to a winner! My hunch? We are going to see great things from Miranda Millen... after all, Jerry Hall handpicked her!